I haven't got any stitching done this week yet. Mainly because I've not been well but I've suddenly got a load of projects and things to do and I don't know where to start. I got the chart to do my Lizzie Kate exchange but I went through my entire box of fabric and still couldn't decide what to stitch it on. I pulled all the threads for it so at least that was something. I found my working copy and leftover threads from my birth sampler that I need to stitch a 2nd of, I even cut out the fabric needed since I'd got the box out anyway. That was as far as I got. I still can't decide on the framing though my foam board arrived so at least I can lace it up. I have been on a little spending spree on Ebay and got one or two magazines though. One was on my wanted list and the other was an issue I had fancied and didn't buy. Since I was in a proper newsagents at the time I decided to buy a professional childcare magazine instead (not often I get the chance). Wish I had bought it though so I looked online and landed up paying nearly double the retail price on Ebay. No backorders available so it was obviously a much sought after issue. I got my eye on one more but that'll be my last. What I really need is a night (or a few) in front of the sewing machine. I've a whole heap of stuff that needs doing. If I would get myself off the computer one evening it may actually happen. I may even get some stitching done! So my hubby offered to take me shopping to Aberdare yesterday so although I felt rough I couldn't possibly pass on the opportunity. Usually I have to drag him there! I managed to pick up a load of things I needed for the house plus some extra bits for some craft activities I'd been wanting to do with Seren. I also got 2 picture frames and an idea. Normally I have my finishes professionally framed but I've had these 2 birth samplers in my house for ages now because I was quoted stupid prices for doing them and/or couldn't find the right frame. One of the samplers will have to wait because it really does need a box frame but the other one is for Faith who is now 1 and a half years old and has just got a new baby sister, who I am going to stitch a matching birth sampler for. The frames are not exactly what I had in mind. I wanted white frames but I thought maybe these would still look nice. 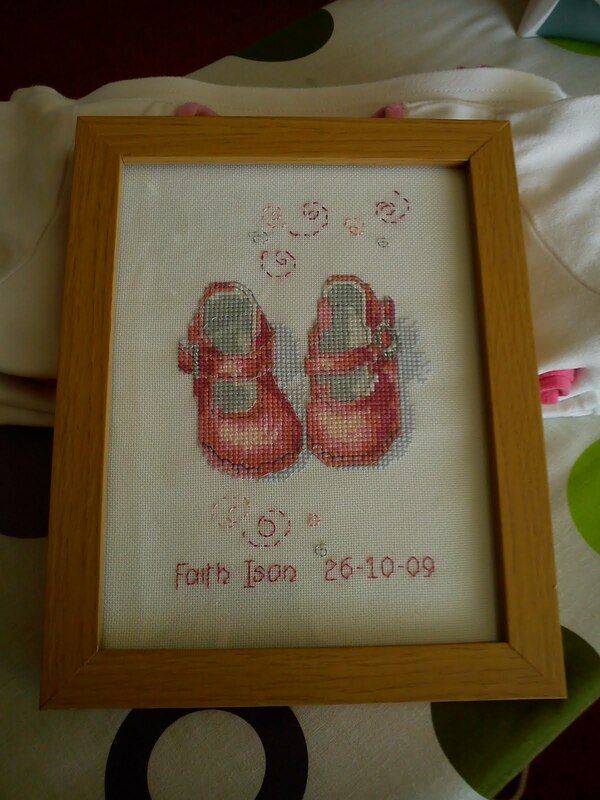 I wanted them to look good so I asked my trusted experts on my cross stitch group for a framing tutorial and voila! they found me a brill one! This is a rough version of my finished piece in the frame. I can't decide whether to frame it as it is or buy the next size frame up and get a light pink mount as well. So what does everyone think? I'd really appreciate any comments bad or good. Well, we moved house and have more or less settled. Today I finally got the all important letter - I've been approved as a Registered Childminder. Yay me!! And so starts a new chapter of my life I guess... the adventure of being self employed! As for stitching...well let's just say it hasn't been my top priority lately. I've done small bits on Baby Boy Sunshine Line but mainly because I realised it was the intended baby's first birthday last month and I'm no where near finishing it! I caught up with my e-mails and signed up for a Lizzie Kate exchange on my cross stitch group so I'm hoping that will kick me back into action. Meanwhile, here's the last picture I took of United in Love. 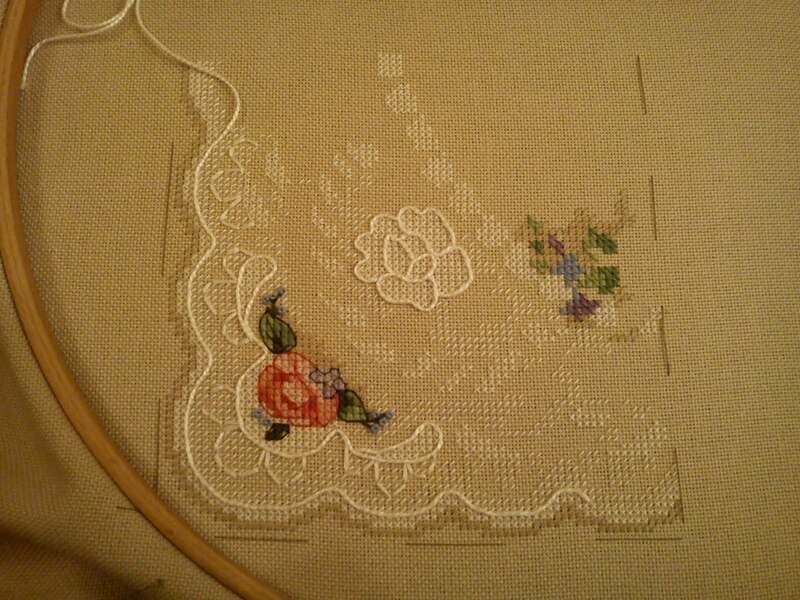 The couching with the perle cotton is turning out real nice even if it is rather fiddly to do. I'm very pleased with the way it is turning out so far. I think maybe it will be laid aside for now until I finish my exchange and Baby Boy Sunshine Line though.